Berkley Center Research Fellow Eric Patterson spoke on “Religion and Populism” in Europe at a November 2018 conference at Sciences-Po University in Paris, France. Patterson, an expert on the intersection of religion and international affairs, was the closing keynote speaker. Eric Patterson is a research fellow at the Berkley Center for Religion, Peace, and World Affairs. He is also a professor at and the former dean of the Robertson School of Government at Regent University in Virginia Beach, Virginia. His research and teaching focuses on religion and politics, ethics and international affairs, and just war theory in the context of contemporary conflict. He has written or edited 13 books, including: Just American Wars: Ethical Dilemmas in U.S. Military History (2018), Ashgate Companion on Military Ethics (2015, with James Turner Johnson), Military Chaplains in Afghanistan, Iraq, and Beyond (2014), Ending Wars Well: Just War Thinking and Post-Conflict (2012), Ethics Beyond War's End (2012), and Politics in a Religious World: Toward a Religiously Literate U.S. Foreign Policy (2011). Other books include Debating the War of Ideas (with John Gallagher, 2009) and Just War Thinking: Morality and Pragmatism in the Struggle Against Contemporary Threats (2007). 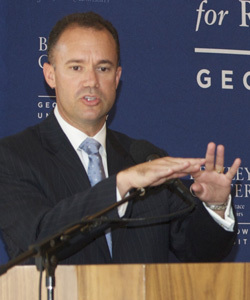 Previously, Patterson spent nearly four years as associate director of the Berkley Center, leading two Berkley Center initiatives: one on Religion, Conflict, and Peace and the latter involving Government Outreach. The former is devoted to teaching and scholarship on the intersection of religion, conflict, and peace and includes the development of teaching resources, including 20 case studies and nine film guides available for classroom use. The Government Outreach program, which brings expertise and resources on religion and world affairs to government agencies, has resulted in seminars and presentations at the Armed Forces Chaplains Center, National Defense University, the Foreign Service Institute, the Naval Postgraduate School, and numerous other government audiences. Prior to coming to the Berkley Center, Patterson spent three years working for the federal government. He served as a White House fellow and special assistant to the director of the U.S. Office of Personnel Management (2007-2008). Before that he was on university leave of absence as William C. Foster Fellow in the State Department’s Bureau of Political-Military Affairs (PM), where he worked on international small arms and light weapons security issues (2005-2007). He returned there for eight months of the 2011-2012 academic year as a State Department contractor, working as deputy director for international programs on the Interagency Man-Portable Air Defense Systems (MANPADS) Task Force in the PM Bureau. Patterson earned a Ph.D. in political science from the University of California at Santa Barbara, an M.Sc. in international politics from the University of Wales at Aberystwyth, and B.A. degrees in biblical studies and music education from Evangel University in Springfield, Missouri. In addition, Patterson has edited two volumes on Christian realism: one on Cold Warrior Christian realists like Reinhold Niebuhr and John Foster Dulles (The Christian Realists, 2004), and a later volume applying Christian realism to contemporary political debates on globalization, conflict, and international institutions (Christianity and Power Politics Today, 2008). His first book, Latin America’s Neo-Reformation, focused on the effect of religious dynamics on the politics of Brazil, Mexico, and Chile. He has published in numerous journals such as Survival, International Studies Perspectives, Journal for the Scientific Study of Religion, International Politics, International Relations, Security Studies, Journal of Diplomacy and International Affairs, International Journal of Intelligence and Counterintelligence, Ethnos Brasil: Cultura e Sociedade, Latin American Politics and Society, and Journal of Political Science. Patterson is a member of the International Institute of Strategic Studies, a past term member of the Council on Foreign Relations, a member of various scholarly associations, and has been awarded Calihan and Rotary Ambassadorial Fellowships. He continues to serve as an officer with the rank of lieutenant colonel in the Air National Guard.